The mission of the Maine Chapter of the American Academy of Pediatrics is to improve the lives of children and adolescents in Maine. Our vision is to be the leading authority, advocate, and voice for the health of Maine’s children and for the profession of pediatrics. Motivational Interviewing Sessions with SBIRT - day long, 7 CME - Two sessions left! From left to right, Advocacy Summit attendees: Ryan Donohue, MD, Chris Rogers, MD, Faculty members Amanda Brownell, MD and Pam Dietz, MD, Chief Resident Amy Stepp MD, Heather Daigle MD, Emily Keller MD, Catherine Ezzio MD, and MAAP VP Deborah Hagler, MD (not pictured). The group from ME, NH and VT met with AAP President Elect Kyle Yatsuda, MD who delivered a talk #putKids1st and Ben Hoffman, MD who talked about advancing this new tri-state collaborative. Maine will likely host this summit in 2019. 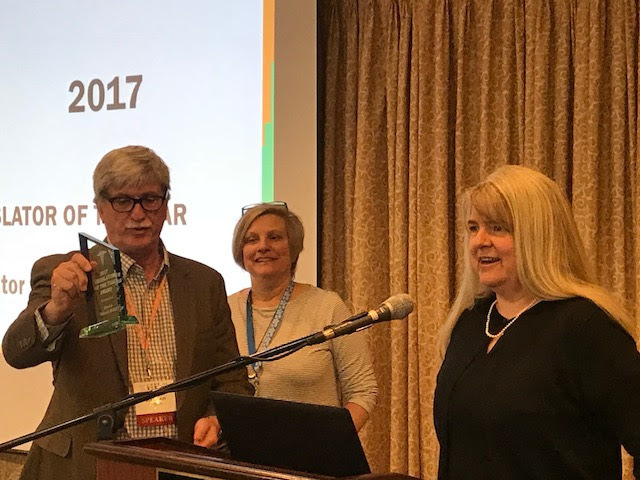 Senator Rebecca Millett Receives Maine Chapter, AAP Legislator of the Year Award - Senator Millett focused attention on legislation improving childhood health and safety including L.D. 40 drinking water at all Maine schools is free from lead; L.D. 230, increasing access to Head Start programs; L.D. 383, putting in place a plan from DHHS to strengthen the quality and supply of child care services; L.D. 384, increasing access to family therapy sessions for families who need assistance learning how to best care for children with behavioral challenges; L.D. 1159, to increase the number of workers with access to paid sick leave programs; L.D. 1113, to make it easier for families to apply for anti-hunger programs in schools; L.D. 1550, to increase taxes on sodas and other sugary drinks; L.D. 1433, to require radon testing in schools; L.D. 1710, to restore funding to school-based health centers; and L.D. 1879, to increase the number of mental health providers.